Say ‘no!’ to the awkward first-dance swaying! 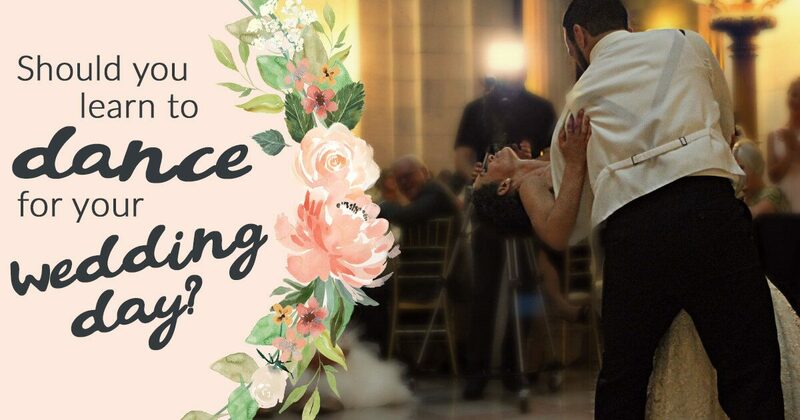 Read how investing in dancing lessons can help to avoid wedding day dance disasters. Your perfect day is going so well. The priest turned up; no-one spoke out at the crucial moment; the meal was fantastic; the speeches were funny and you’ve managed to keep Dad away from that 3rd bottle of wine. So far, so good. But now it comes to your first dance. The lights go down. Everyone is smiling and the music starts playing. You take your new spouse in your arms and in your mind you’re dancing like ballroom dancers from the 1920’s. Don’t do a Peter Griffin: learn to dance before your wedding day! The last thing you want is to be left red faced with embarrassment as your loved ones look on at you. It’s a special moment. Yes, its awkward but you want it to be a tender moment. The groom is not supposed to look like a clown (that’s the best man’s job). The newly-married couple are meant to look elegant during their first dance. While it might be a talking point afterwards of the groom tripping over and into the wedding cake – it’s not the talking point you actually want. Yes, you’ve gone through the whole ‘wedding’ day where you have declared your love for each other, but the first dance is seen as a moment for just the two of you. You want to savour it. It’s proof to everyone that you are now husband and wife and it will show your family and friends that this is the happiest day of your lives. So, sign up to those dancing lessons and make sure you aren’t left red-faced on the dance floor. Fear not, beautiful bride. Rain on your wedding day is not the end of the world. A little bit of planning ahead and a positive attitude can turn the rain into a fantastic opportunity for unique, striking photographs and a wonderfully intimate wedding. It’s finally the day of your wedding. It’s taken months of meticulous planning, thousands of pounds and a whole lot of effort (and occasionally tears), but the big day is finally here – your wedding day! You wake up, refreshed and excited, only to pull back the curtains to see a torrential downpour of rain that shows no signs of stopping. Should you panic? No. Burst into tears? Certainly not! Fear not, beautiful bride. Rain on your wedding day is not the end of the world. A little bit of planning ahead and a positive attitude can turn the rain into a wonderful opportunity for unique, striking photographs and a more intimate wedding than you might have otherwise had. We know it’s not ideal, but there are so many ways in which you can turn rainy weather into your advantage. Is it bad luck if it rains on my wedding day? Absolutely not! In fact, rain on your wedding day actually symbolises good luck. Rain represents different things to different cultures, but all seem to agree that it’s a positive sign for the loved-up couple. Rain waters the ground, leading to improved fertility for the plans and vegetation – it will do the same for your marriage. Rain on your wedding day is said to be signify that your marriage will last. This is because wet knots made of rope are harder to untie, therefore when you “tie the knot” on your wedding day, the same will be true of your vows. 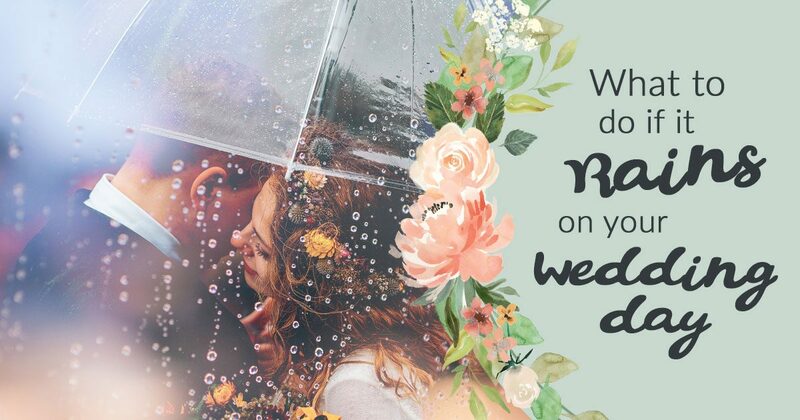 The raindrops on your wedding day signify the washing away of all negative memories or occurrences with your partner, allowing you to start afresh from that day forward. This is especially important if you’re planning an outdoor ceremony or reception. Wedding venues will be used to bad weather on the big day and will be able to advise you of their contingency arrangements. That might mean switching to an indoor area that’s not the exact place of your dreams, but that’s much better to making your guests sit out in the rain. Different photographers have different rules about working in the rain. Some may be up for getting a little bit damp, but as their equipment is worth thousands of pounds, they won’t be willing to risk a drenching. Talk to them about their preferences for working in the rain; they might be able to work the weather into the photos for a dramatic atmospheric effect. Many wedding venues have discreet, intimate areas that are perfect for newlywed photographs of you and your lovely groom. The venue staff should be able to arrange a private space away from your guests to allow you to have some time alone with your photographer. Similarly, they will be able to suggest larger, more open spaces for group photographs with your families and guests. Getting married at your local church which is only a minute down the road? Planning on walking to the venue? What about an open-top car or horse and carriage? All of these wedding transport options can fall foul of the Great British weather. Plan a contingency just in case it’s raining on the day – even if it’s a massive umbrella and a raincoat over your dress until you arrive at the venue doors. Relax, stay calm – it’s going to be okay! The worst thing you can do if it rains on your wedding day is to start panicking. This will set the tone for the rest of the day and cause you to get incredibly stressed as the morning progresses. You should enjoy the morning of your wedding; don’t let a little thing like a bit of rain get in the way of that. Ask your hair and make-up artist if they can stay a bit later or follow you to your wedding venue for last minute touch-ups once you are safely inside. They may not be able to do this if they have another wedding booked after you, but it’s worth asking. Even if you have to pay a little bit more, it’s worth it to know that the walk from the car park to the venue doors won’t cause any damage to your beautiful bridal look. Perhaps an obvious one, but if you’re likely to spend time outside (even just walking from your car to the venue doors), waterproof make-up is a must-have. Plus, you know, you don’t want mascara streaks when your tears of happiness escape when you’re saying your vows. Some guests are born to complain. And they will. Weather they are moaning that you didn’t think beforehand to buy an umbrella for every single guest, or whining that they want to go outside to wonder around the venue gardens, just take a deep breath, smile, and walk away. You don’t need that sort of negativity around you! If you REALLY want that photo of your dress draped over that beautiful metal-cast bench in the gardens of the venue, that still may be a possibility. Remember to bring towels on the day – maybe give them to a trusted wedding guests or groomsman to leave in their car. That way, if the sun pops out, you can rush over, dry the bench and nab the photo. The weather can be highly predictable: pouring with rain one moment and then blue skies the next. You don’t want to spend your wedding day staring out the window so assign a “weather watcher” to do that for you. It will be their job to monitor the weather and let you and the photographer know when there’s a sunny spell so that you can dash outside for some photographs.